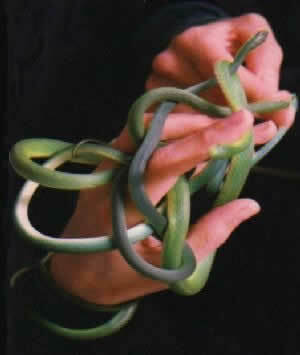 The beautiful Rough Green Snake is not only lovely to look at, but is so very gentle that it is a pleasure to handle! The Rough Green Snake is and excellent climbers and very agile, but they are also quite wiggly. They never display a bad temper and rarely if ever, attempt to bite. Despite their pleasant temperment they are a more difficult snake to maintain in captivity, and are suggested for a more advanced snake keeper. Distribution: The Rough Green Snakes are found in North America. Specifically they are found in the eastern part of the United States; Connecticut to Florida, the Gulf States, and the Mississippi Valley to Kansas, Illinois and Ohio. Description: The Rough Green Snake is slender with keeled scales and a very long tail that tapers sharply to a pointed tip. They can reach up to 28" (71 cm). Void of patterning, this snake's coloring is iridescent leaf green on top with whitish to yellow to yellowish green underneath. Feeding: They should be feed live insects once or twice a week. Good insects to feed are crickets and moths. Soft-bodied insect larvae such as waxworms, butterworms, and mealworms are also good choices. Fresh water in a shallow dish should always be available. Environment: The rough green snake is an excellent climber and likes an arboreal type setting, so a vertical or semi-vertical tree limb with plant vining is great. The terrarium should be at least a 10"x14"x10". See Basic Reptile and Amphibian Care for more information. Breeding/Reproduction: These snakes lay four to twelve very elongated eggs. They will be deposited under a flat stone or a log, usually at the edge of the woods, where it meets a meadow. The young can be a grayish green to a pale delicate green at first, becoming the beautiful iridescent leaf green as they mature. Availability: Though the Rough Green Snake is generally available, they can be difficult to maintain in captivity. This is thought to be because we don't fully understand their natural diet. A variety of foods is probably best. This was the very first snake I ever had and what made me fall in love with snakes as a child. My dad brought home two rough green snakes that he found while out hunting. Once I held them, I was addicted. I would love to own one again someday. I currently own 16 corn snakes and 12 Kenyan sand boas which I also breed. Please keep in mind that, as the article suggests, these are typically not good starter snakes for begginer snake owners. The best snakes for beginners would be the corn snake and the Kenyan sand boa. There are also a few other snakes that would also fall into that catergory, but always do your research when purchasing a new pet of any kind. Make sure you know and have all you need before making the purchase to make sure your pet has the best chance at a long healthy life. These snakes like to climb so have planty of branches for them to climb. There is a variety of substrates that you can use for these snakes. Make sure to all ways have water available. They do well in 70° to 80° F with moderate humidity. Lighting requirements are minimal, they do not need full spectrum lighting though it is good for long term maintenance as it helps them feel good. You can use a substrate heating device for basic heating. For additional heat, you can add a full spectrum incandescent daytime bulb and a blacklight bulb or red incandescent bulb for nighttime heating. Be sure you use a thermometer so you don't let the terrarium become overheated! You can also use a heat mat though it's probably better to use a heat lamp due to them being arboreal or to use both since they will also want to be on the floor of their vivarium. One thing you need to consider is not only having a thermometer but also connecting your heat lamp and/or mat to a thermostat. The thermostat is very important to help regulate the temperature in your vivarium. Make sure to vary their diet and never ever use wild caught insects since they may have been subjected to insecticides which could harm your pet snake. Can you put more that one together if there not mating?? I wanted to get mine a friend but not sure if they can share the same aquar? you can put like sized ones together. Keep an eye during feeding time.